Powered by an internal rubber band, each pop up Pyramid is supplied with its own custom mailer called a zippalope. 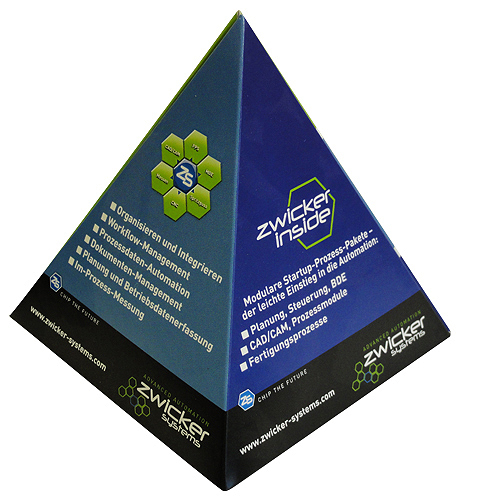 This promotional Pop Up Pyramid has a square-based giving 4 triangular faces to carry your custom-printed message. The design is popular for all kinds of messages as it adds kudos and a touch of luxury to any business marketing campaign. 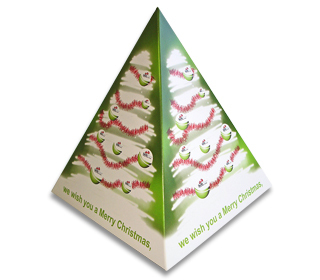 It is always popular when designed as a promotional Christmas tree and as a promotional pop up desk calendar. The pop up pyramid has also proved to bring very successful results in event marketing when sent as an invitation for corporate events and prestigious parties. 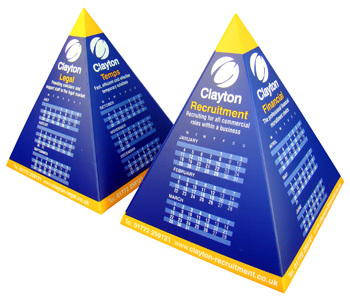 Promotional Pop-up Pyramids are very popular offering an attractive alternative to other promotional pop-up shapes such as pop-up cubes and pop up boxes. 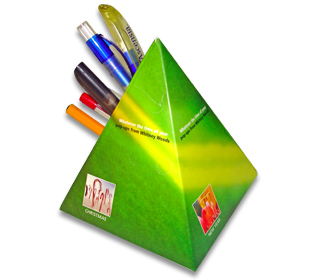 We also offer the Pyramid pop up mailer as a promotional desk top pen holder accessory when holes are added to one of the four sides; this is unusual and very eye-catching as the pens and pencils lie in the pop up pyramid in “wine-rack” style. This promotional advertising product has been a great success as a promotional mailer and is particularly popular as a corporate Christmas greeting, since it is the ideal shape to print as a Christmas tree. Other marketing ideas for our pop up pyramids could be suggested by these words and phrases: A-shape; cone-shaped; traffic cones; witches hat; Halloween; dunce’s hat; angled; mountain; peak; tree; snow-topped; skiing holiday; Alps; Egypt; zenith; at the peak of; taper; pointed; get to the point.